The Victorian-era lanterns shrouding the stage in an eerie glow suggest an era when superstition ruled peoples beliefs rather than science. 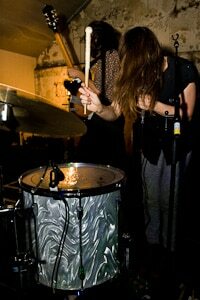 This sets the mood that Esben and the Witch manage to bring to life in all areas of their performance. 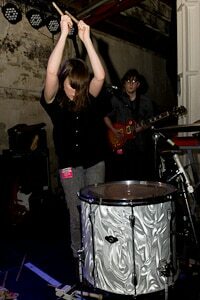 Shimmering and echoing guitar builds gently as they open with Argyria, singer Rachel Davies peering mysteriously from behind a sweep of hair whilst wielding a wand-like stick over a single drum. The beats deepen and the wall of sound rises in pitch and volume to a crescendo that sends shivers down my spine, guitarist Dan Copeman swaying and thrashing behind Rachel as though bewitched and a living conduit for his sonic output. The show is impressively moody and captivating from start to finish, Esben and the Witch’s rich blend of gothic post-rock and electonica provides a rewarding listening and viewing experience which invites revisiting.